Dieser Beitrag wurde unter English, Film abgelegt am 14. November 2015 von Kilian Evang. Dieser Beitrag wurde unter Chinesisch, English, Zeichnungen abgelegt am 29. April 2015 von Kilian Evang. Dieser Beitrag wurde unter English, Zeichnungen abgelegt am 1. April 2012 von Kilian Evang. Dieser Beitrag wurde unter English, Technik abgelegt am 24. September 2011 von Kilian Evang. Ten guests are invited to a large house on a small island. When they arrive, their host is nowhere to be found. Soon, they hear a mysterious voice that accuses them of being guilty of murder – then, suddenly, one of the guests drops dead – poisoned! One down, nine to go! The excitement never lets up in this classic and brilliant murder mystery presented by the Anglo-Irish Theater Group. In this English-language production of Agatha Christie’s And Then There Were None, which through its take on the afterlife of the murdered guests adds a whole new edge to the classic murder mystery, I myself will be playing the role of General MacKenzie. 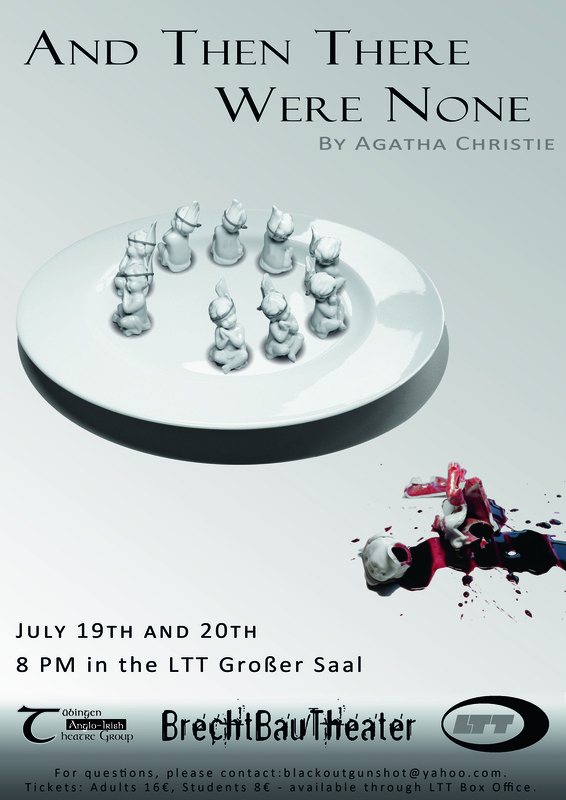 Texttheater readers with physical access to Tübingen should not miss this opportunity to see us, the Anglo-Irish Theatre Group, on the most important theatrical stage of our small university town, the Großer Saal of Landestheater Tübingen (LTT). We perform on Tuesday, July 19th and Wednesday, July 20th at 8 PM. Tickets should be available on line (if the booking system works, it didn’t for me), through booking offices and from the box office located, like the theatre, at Eberhardstr. 6. Dieser Beitrag wurde unter English, Kunst, Leben abgelegt am 5. Juli 2011 von Kilian Evang. Having switched from Ubuntu to Debian Squeeze and pondering ways to combine the security of a largely stable operating system with the additional functionality afforded by individual newer software packages, I recently wondered: Apt pinning seems complicated, why not just add testing sources to sources.list and use apt-get -t testing to get whatever newer packages I need? I can now answer this question for myself: because if you are under the impression that upgrade tools like apt-get and Synaptic are aware of the “current distribution” and will never upgrade beyond that unless explicitly told so, then that impression is wrong, even if apt-get’s occasional “keeping back” packages and the name of the command to override this (dist-upgrade) may suggest it. You will thus inadvertently upgrade your whole system to a non-stable branch. And when you finally notice it, you will then, more out of a desire for purity than out of actual concern for your system’s security, use Apt pinning to try and perform a downgrade. The downgrade will fail halfway through because the pre-remove script for something as obscure as openoffice.org-filter-binfilter has an obscure problem, leaving you with a crippled system and without even Internet access to try and get information on how to resolve the issue. By this point, reinstalling from scratch seems more fun than any other option. And so I did. Another lesson learned: Do use the first DVD to install Debian, it contains a whole lot of very useful things such as network-manager-gnome or synaptic that are not included with the CD and that are a hassle to install one by one. And there’s also a new unanswered question: why did the i386 DVD install an amd64 kernel? Dieser Beitrag wurde unter English, Leben, Technik abgelegt am 3. Juni 2011 von Kilian Evang.